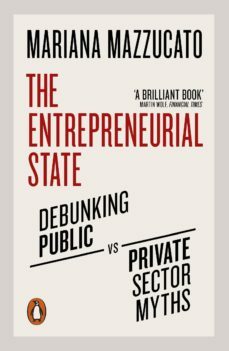 From one of the worlds leading economists, a bestselling expose of the states crucial role in sparking innovation and growth-and the dangers of ignoring this truthConventional wisdom holds that innovation is the preserve of the private sector, best left in the hands of that modern day folk hero-the lone entrepreneur. In this popular tale, the role of the public sector is simply to get out of the way, at best fixing market failures, in order to facilitate our daring heros bold, risk-taking endeavours. But what if this powerful, contemporary myth is wrong? In this sharp and controversial expose, Mariana Mazzucato comprehensively debunks the myth of a lumbering, bureaucratic state weighing down a dynamic private sector, to reveal how public investments have been behind many of the greatest innovations of our time. From the technologies that make the iPhone smart, to biotech, pharmaceuticals and todays emerging green technologies, it is the state that has been the investor of first resort, our boldest and most valuable innovator. Meanwhile, the private sector only finds the courage to invest after the entrepreneurial state has made the truly pioneering, high-risk investments. This false narrative has real world consequences - a select few get credit for what is an intensely collective effort, privatising rewards reaped from socialized risks. Mazzucato makes a powerful case that a failure to understand the states entrepreneurial role is leading us down the wrong path-towards a future of stagnant growth and increased inequality. As we face the new challenges of the twenty-first century, Mazzucato argues that we need to reinvent the entrepreneurial state, to co-create the opportunities of the future -- and the kinds of public-private deals that will allow smart, innovation-led growth to also be more inclusive growth.